Tell us what you expect Snapmakerjs to have or to upgrade in the next version. The more needed functions are more likely to be developed first. I would think the option to double an axis. I believe your controller supports one doubled axis, is that correct? @Tone Yes, The main control has four ports. One was saved for one extra linear module. For example, It can be the other Z-axis for Double-Z version. 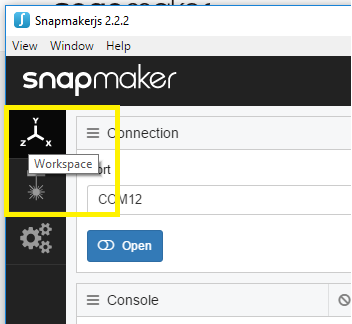 Snapmakerjs is host software. It only needs to know four axises. X, Y, Z, A(ToolHead). Double Z feature I think is handled by firmware. For laser alignment - it would be great instead of tracing the drawing area (run boundary) if there was an option to trace the drawing outline or key points - so the image could easily be more precisely aligned with the object being engraved, and the user could easily avoid engraving content being under a support. Also a sample laser alignment file for use to calibrate the laser for initial use. 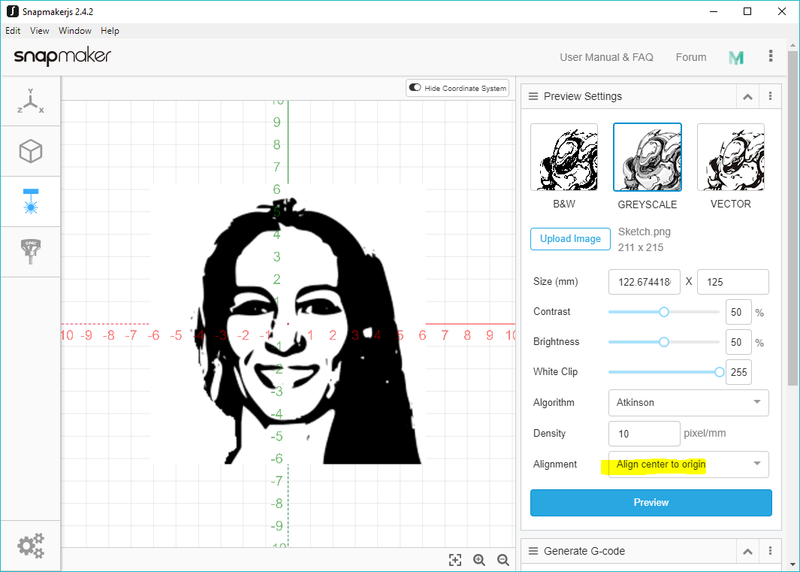 Something that shows the alignment and engraving area, and allows the user to see the resolution and compare it to a sample result. Is it possible that you can update the software so that you can make adjustments in the three prep mode without going into custom. I’ve had Issues with the object sticking to the bed and I’m using custom and I’m at 55c and I making good progress. 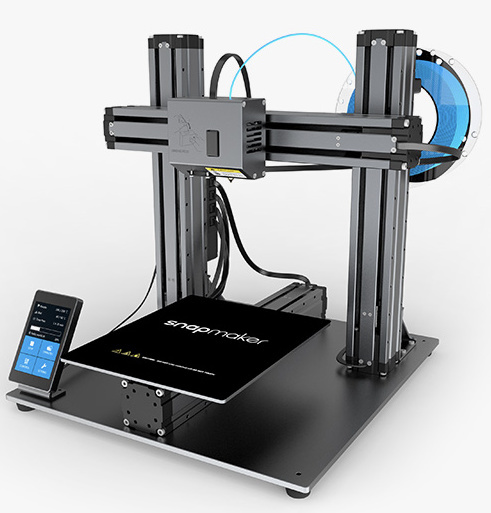 It would be nice to be able to adjust temperatures on the three print modes . Thank you for your feedback and advice! We have recorded your feedback in our improvement plan. We will decide if we will improve these and when we will make the improvemnt based on the importance and urgency of the problem. I have an idea, 3D carve in wood or plastic and then 3D laser etch to make the 3D carving stand out and look even better. Is that possible with the current software? Or does the laser etch only work on a 2D surface? Cool idea! Current software’s laser function only supports 2D surface. I think your idea is doable. A little bit complex but doable. We get the 3D model. Then we can calculate the Z-height to move laser head along Z-axis to keep laser focused to achieve your goal. 2.5D laser engraving, 👍 Brilliant idea. But I am afraid that it has very limited use case. Use laser etching to do post-process for cnc work is hard to compete with other methods. After all, it’s not colorful, only burns black and white or greyscale… And it took so much effect to make a relief cnc piece. It’s hard to predict its effect regarding to laser-etching in 2.5D. Glad that you share your idea here. Although I don’t think many people need this feature. I do think it’s interesting idea, I might do some trail in coming months, If I make some progress, I will keep you updated. How about adding “save project.” I want to repeat logos on similar items. Having to reset everything is a pain. Also how about importing vector files (.EPS, .ai, .CDR). A couple of suggestions fro your consideration to improve SnapmakerJS application. The two menu items on the left of the screen have a popup name of Workspace. Consider a different name for each function. After you load an image and generate the gcode and load it; the image is blacked out. I have noticed a few comments on the forum where this has caused confusion. Can we have the image being displayed correctly so that we can watch the tool head in what it is doing relevant to the image? Perfection can never be attained, however you are off to a great start. Please make a material testing option(diffrent speeds and power in same small test print) and mybe also focus testing option. I would like to set the origin by the centre of the image in Laser engraving. This method allows the center of the item to be measured and marked (say with pencil) then the laser aligned to this point. I often have issues with images not centering correctly due to white space on the edges, odd sized artwork and different size objects to engrave on. By centering the image and the laser then this issue becomes a no brainer and therefore less errors. Have you tried the Alignment option “Align center to origin” ? 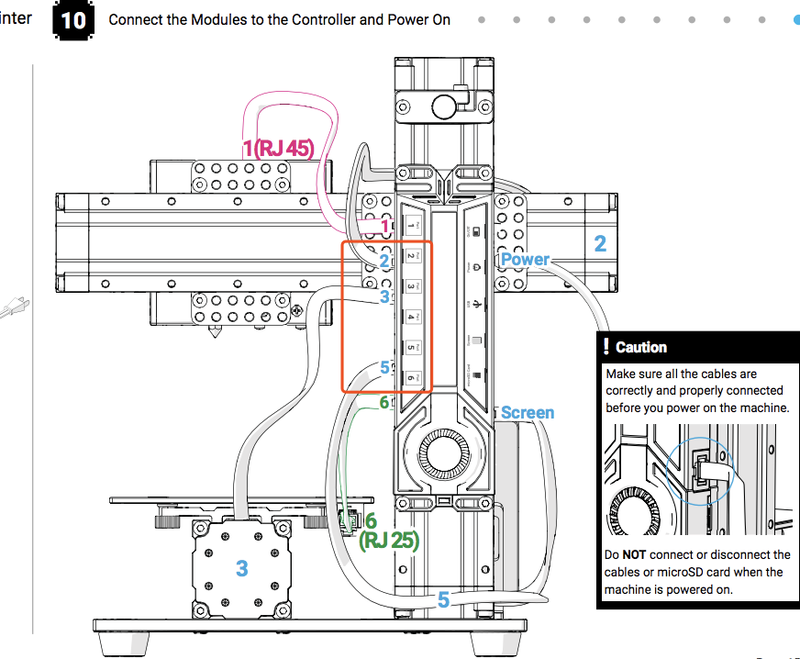 I would like to have its CNC and Laser limits to 9,x * 9,x cm² removed. As far as I understand these limits are set to keep clear of the fixations. However, while the native 125mm * 125mm printing size is already small, carving or burning on an even smaller area limits the possible jobs even more. Most of the times I don’t need to use the full range, but something like 110 * 70mm², leaving plenty of room for the fixations on the narrow side and going the full range the other side - with no addional fixations on that end. I admit this might increase the risk of cutting into something wrong, but I dare to say that humans who design 2D or 3D stuff are able to handle that risk - or live with the consequences (broken bit). It might be designed as an unlock feature with the usual disclaimer. Hah the limitation is due to the blank part of your image, Snapmakerjs is just showing and scaling on your original image (with blank) and the size can not exceed 125mm * 125mm. Please remove them from your image and test it again. No, my SVGs were right, but I didn’t test the limits cause in former versions of Snapmakerjs the bed size was indeed limited to around 90mm each side. They must have changed it with some update, my bad I didn’t check before. Thanks for your advice, I just tested 125x125mm² with CNC and it worked fine! In the 3D Printing section I would very much like to see the ability to save different Custom Materials, much like the ability to save different custom Print settings. Similarly the ability to save custom carving tools in the CNC section. It would also be nice to be able to save each of these customizations in a separate reloadable file for sharing as well as archiving. There should be a mechanism in place when upgrading the software to migrate user customized settings. Keep up the good work, this software is developing fine.